Seems I’ve been putting off this review for quite awhile now and I’m not sure why. I was just waiting for the right time to review it when I had a good chance to sit down and enjoy. A while ago you might remember I reviewed the the 2010 blend of the Oliva Serie V Maduro Especial and had some mixed feelings about it. In that post I had a VERY generous offer from one of our readers to send me one of the highly praised 2008 blends to compare, and I gladly took him up on that offer. 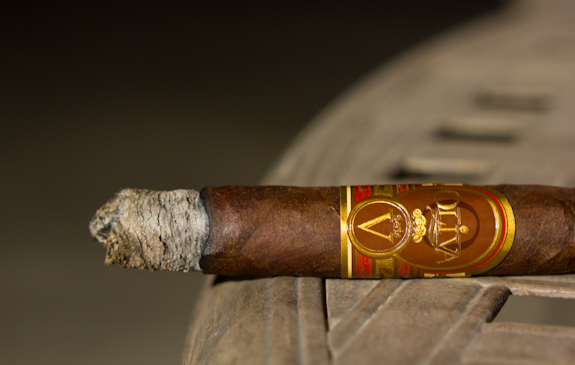 So today’s is review is brought to us by Komodata, one of our many awesome readers, who was kind enough to send me a 2008 Oliva Serie V Maduro Especial. Thanks so much Komodata! Really appreciate the chance to get to enjoy a nice cigar like this. 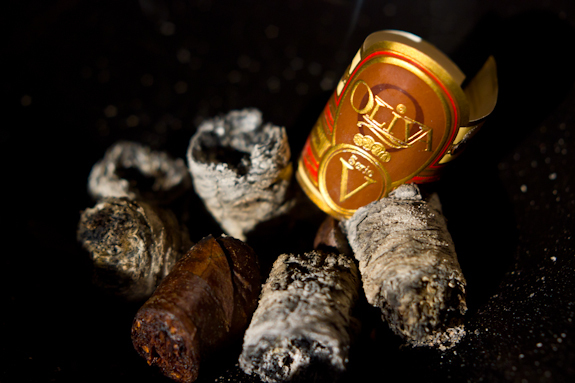 So this blend was launched by Oliva on October 15, 2008 to follow up on the success of their 2007 limited edition release. There were a couple differences in the release though. 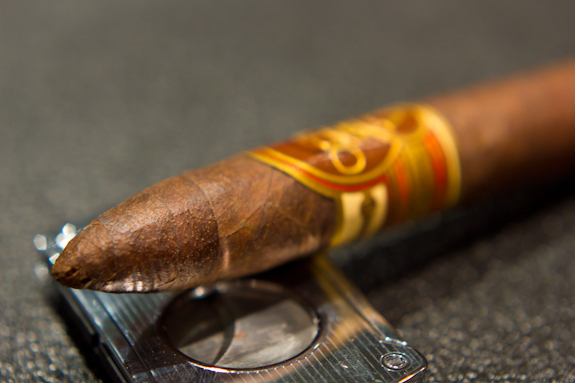 Firstly, the name was slightly changed from the original “Oliva Serie V Liga Especial” and the ring gauge was knocked down a bit to 54 but the length was extended to 6.5. 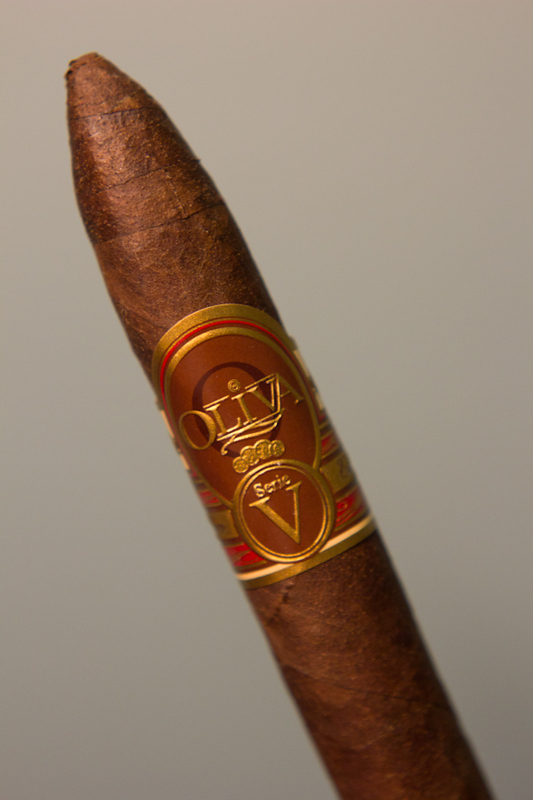 Now the original plan on this 2008 Oliva Serie V Maduro Especial was actually to make it to make it a 54 ring gauge. As the story goes, this vitola it was too strong and overpowering so they actually took out some filler and ligero to make it a 52 ring gauge. All-in-all, 50,000 sticks were made and distributed to approximately 250 retailers, most of those were US but some were sent across the ocean to a few select European retailers. They are pretty hard to come by now a days but there are still a few aging in some lucky people’s humidors. So without further adieu, let’s see how this cigar stacks up! 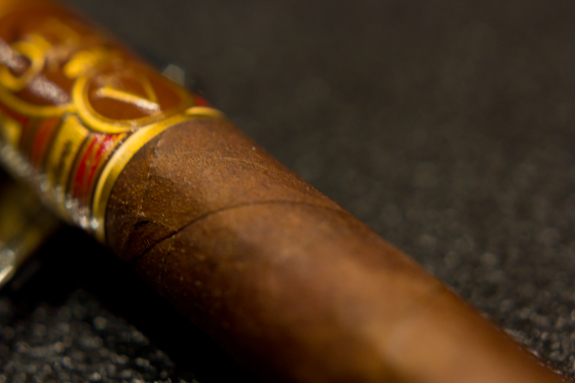 •	There is some interesting complexity to this cigar if you sit and pay attention to the flavors, some subtle notes I’m picking up in the background include a bit of meaty flavors, a bit of vegetal notes, and even some roasted nuts of some kind. •	The flavors continued to intensify and surprise me to the very end with hardly any bitterness at all, I enjoyed this cigar down to the very nub and even busted out the toothpick to get maximum enjoyment! 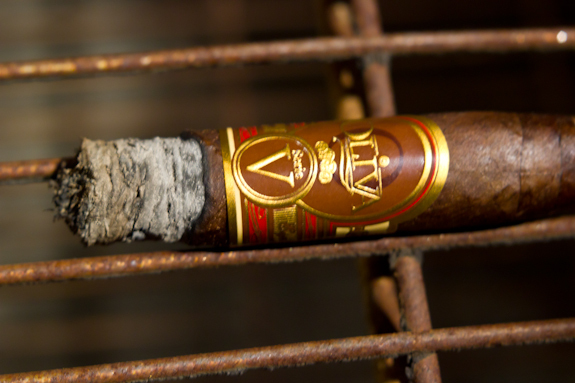 I think the sheer number of flavors I mentioned in my tasting notes is a good indication of how complex and enjoyable this 2008 Oliva V Maduro cigar was. It kept me on my toes the whole way through and teased me to pay extra attention so all the subtle notes as well as the ones that were obvious and super tasty. Everything kept in great balance and the smooth creamy finish was a perfect touch to end each draw. Some people had warned me this would be a full bodied smoke but I think it stayed in the medium range for the most part and I didn’t even have a big dinner before smoking this. The age of this particular stick may have contributed to a little loss in body but the flavors were still in full swing. These are obviously super rare to come by these days but if you manage to track one down I’d highly suggest fighting to give it a try, it’s a great experience to add to your cigar journal. So this was one of my first forays into Barley Wine and I decided to chose a local brewery, Mill Street, based out of Toronto. This happens to be from their 2011 batch. It comes in an awesome bottle which I think is some kind of ceramic or something, along with a nice swing top cap. I wasn’t really sure what to expect but I knew it had some high alcohol content(11.5%) so I saved it for a time when I could enjoy it at night. Well to my surprise I was met with what I can best describe as a stout on steroids! It’s so thick and creamy with dark notes of roasted malts and roasted coffee. The creamy finish really sells this brew and I enjoyed the heck out of it(as Tony would say 😉 )! I can definitely say it was an awesome pairing to go with the Oliva V Maduro, the roasted coffee and malt notes matched with the cigar perfectly. 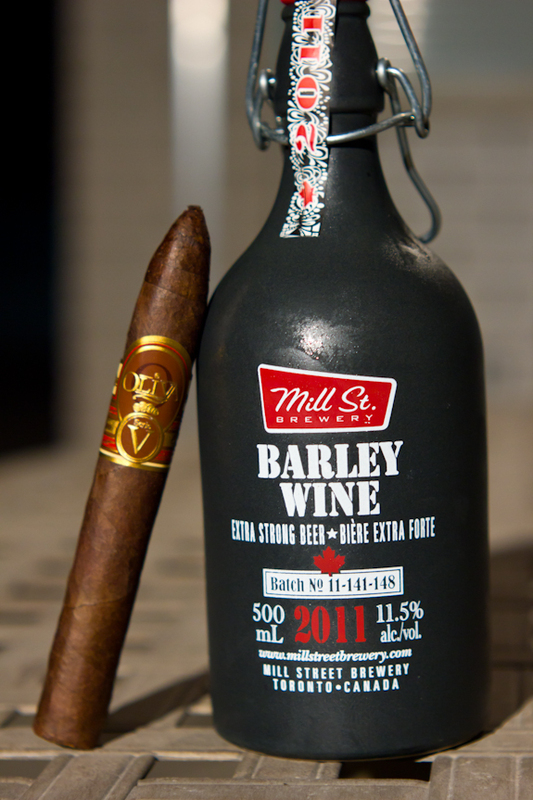 Other great pairings would include a stout, port, scotch or a strong coffee. 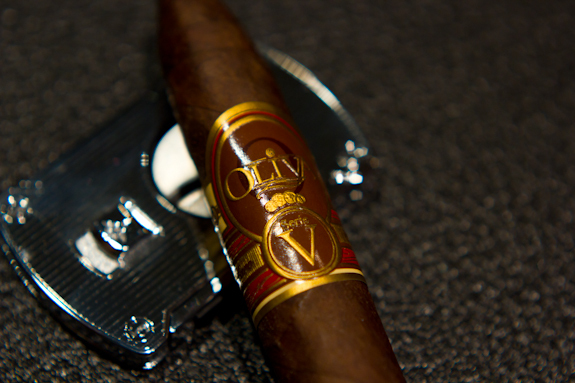 Big fan of the Oliva V Series and to be honest I have one or two of the maduro versions in my Humi but haven’t tried them yet?!?! What am I waiting for. My only grip with the Maduro versions is they don’t date the sticks and I know I have different years so I will have to take a wild shot at them but I can’t wait to fire them up. Do you think the Age helped or hurt this stick? I didn’t have a chance to smoke a fresh one of these but I can only assume it got better with age cause this was darn good. 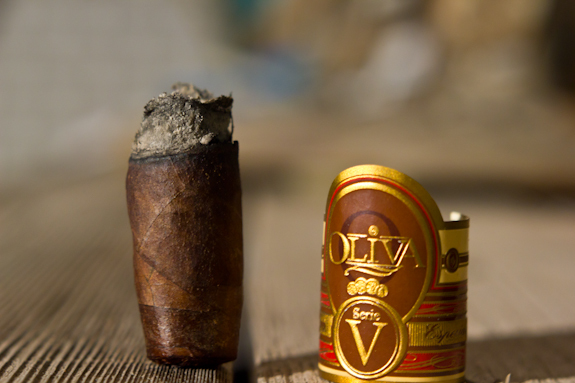 You may be able to tell yours apart by their vitola, some of them were slightly different sizes depending on the year. I had 2 boxes on order with a large retailer. Someone in customer service erroneously told me later that mine were on back order. I ordered 2 boxes elsewhere, then ended up with 4 boxes total. Best customer service screw up in my life. I loved this cigar when they first came out. Smoked one about 2-3 weeks ago, first in a very long time…yellow cello, but cigar is holding up very well. Yes, they have mellowed. However, what was once a good cigar is just friggin’ phenomenal now. One of my top 10 all-time favorites ever. 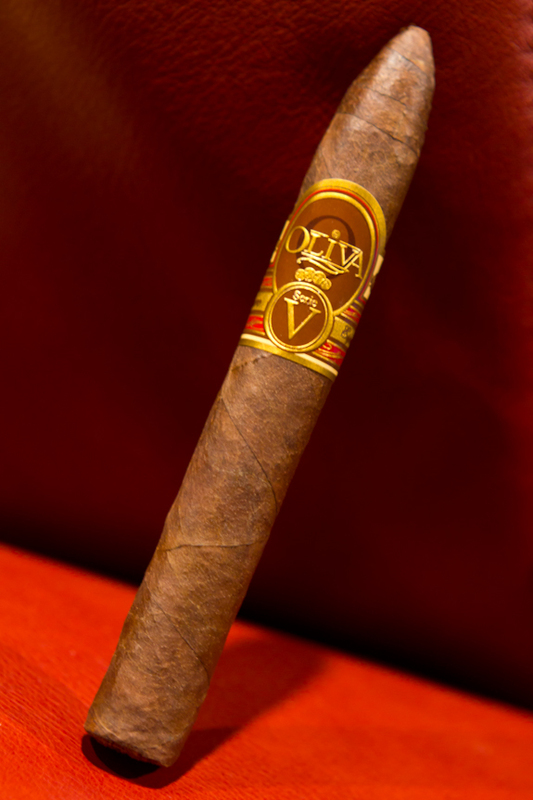 I begged the Olivas to make more when I saw them at Cigarfest in 2009. They have, with different wrappers. I’ve enjoyed them to varying degrees, but IMHO, the 2008 is still the best. The 2008 V maduro has, to put it simply, become an experience I enjoy tremendously. Few cigars in my collection (so far) have aged as well as these have. Gotta agree with you pacman, this was a damn fine smoke and definitely put the 2010 and 2011 versions I’ve had to shame. Would be great to see them make this same blend but even so, the crop wouldn’t be the same and it might not turn out as awesome as these. Enjoy the ones you have left! Thanks for the comment. Happy to oblige. Nice to see someone else discoverd what a gem these have become with age. And yes, the other iterations could get better with age. I doubt they will approach the 2008, however. The didn’t have the same level of depth to them when released. However, since I like what the Olivas are doing, and I have V maddies from each of the other years, I am certainly rooting for them. I fear the Olivas may have spoiled some of us with the 2008 version. A cigar that retailed for $8, sold in smaller boxes of 10 (which reduced risk of getting stuck with 19-24 the customer might have been saddled with if he/she didn’t like them), is pretty damned admirable. My hat is off to the Olivas. BTW, totally different cigar, but for those who missed out on the 2008 V maddie and can spend about $30 more, a box of 10 Cuban Bolivar Gold Medal is a nice buy. Smaller than the V maddie, and certainly milder, but a little flavor bomb. BTW, I could be wrong about this, but I believe the first year, the wrapper was the classic connie broadleaf. I think the 2009 was Nicaraguan, then the 2010 was a Mexican San Andreas. On the 2011, I literally read that it was one of the following: connie BL, Nic, or San Andreas. In fact, several reviews on the 2011 that I read asserted it was one of the three. I suppose the only way to know for sure would be to ask the Olivas. As I say, however, I could be wrong on the wrapper year-to-year. I have one sitting in a travel humidor, I had one about 2 months ago, they are simply fantastic, saving the next one for a special occasion. Great review, spot on.